A MAN WHO was claimed he was illegally adopted and his birth mother have settled their High Court action against a Catholic adoption agency and the State. 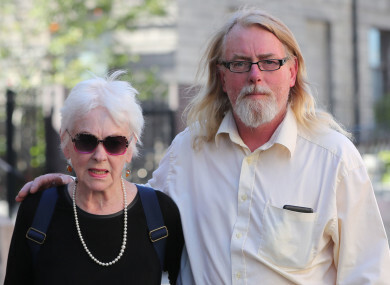 Tressa Reeves, nee Donnelly and her son Patrick Paddy Farrell, aka Andre Donnelly, had sued St Patrick’s Guild (Incorporated) adoption society which was run by the Sisters of Charity Nuns, and the State arising out of her long search for him following his adoption in 1961. The defendants denied the claims. Reeves gave birth to Farrell at a clinic in Dublin on 13 March 1961. Days later he was placed with a family at Liscolman, Tullow, Co Carlow and given the name Patrick Farrell by the now deceased couple Jim and Maeve Farrell. Reeves spent decades looking for him and they were reunited in 2013. Farrell did not know he was adopted until late in 2012 some months after Maeve Farrell’s death. Reeves, now living in Cornwall in England, spent decades looking for her son claimed given the “brush off” by the St Patrick’s and other others in authority when she sought to make contact with him. The court heard Reeves, who came from a respectable Catholic English family with Irish connections, was sent to Ireland after she became pregnant in 1960. She gave birth to her son at the Marie Clinic in Dublin in March 1961. She called him Andre, on the basis he would be the only Andre in Ireland, in the hope of someday finding him. During her long search, she claimed she was told by a nun that adopted children don’t look for their birth parents and that he had been likely sent to America. She eventually learned in 1997 that he had been placed with an Irish family, but despite her requests was not given information that would allow her to make contact him. Farrell was only made aware of his true origins in 2012, and told the court that while Maeve Farrell had doted on him, Jim Farrell regularly subjected him to physical violence. Both Farrell (aged 57) and Reeves (aged 79) said his ‘adoption’ was unlawful and claimed his placement with the Farrells was done without the legal safeguards provided under the adoption laws. They claimed false birth and baptism certs were procured in respect of baby Andre. They sought damages for alleged false misrepresentations made concerning Patrick’s location. They also alleged St Patrick’s engaged in a conspiracy, deceit and failed to provide them with information about each other in a timely manner. They claimed there was a failure to protect their family rights and that Andre/Paddy was placed with the Farrells, whose suitability was never assessed. The State, it was alleged, failed to vindicate or recognise the mother and son’s rights. The claims were all denied. The society, represented by Felix McEnroy SC had it did not make any false misrepresentations or tried to thwart Reeves’s effort to trace her son. The State parties, represented by John Rogers SC claimed they were strangers to the claims and are not liable for any wrongs committed against the plaintiffs. Email “Mother and son who were separated for 50 years settle High Court action against adoption agency”. Feedback on “Mother and son who were separated for 50 years settle High Court action against adoption agency”.